Three students from San Antonio had a particularly memorable 2018 Colorado LDZ, steering their legislation to passage during the three-day session this past Wednesday to Friday, highlighting another successful program in the long, rich partnership between Colorado State University and the National Hispanic Institute. 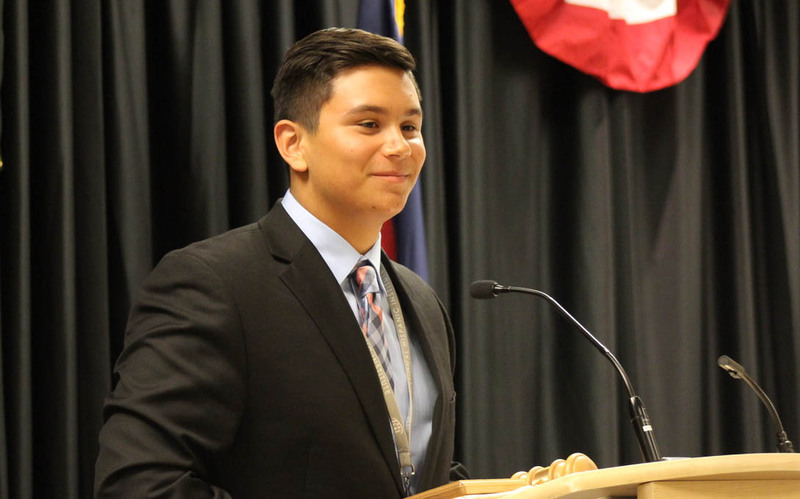 Dixon Espinosa, from LEE High School in San Antonio, won passage of a bill to “promote education of governmental mechanics,” and Jhon Espinosa, also from LEE, proposed to “establish a program that teaches the healthy diets that already exist in the Latino community. Alamo Heights High School’s Marceli Ollervidez saw her bill to “re-assimilate incarcerated Latinos into the community” win support. As the brothers explained, they considered the arrangement a “right place, right time” situation — with one in the House and the other in the Senate, they were able to co-sponsor each other’s bills and move them toward passage — though Jhon admits to rewriting his four different times, in part to absorb all the pointers from four different junior counselors who gave him pointers. “I think it can really help when you express yourself through words,” said Ollervidez about her process at the Colorado LDZ. She also observed, “Your first idea isn’t always your best idea,” noting that she came up with an initial proposal before generating the idea that successfully made it through the LDZ process. “It’s an amazing partnership. It’s been fun to watch leaders at our campus . . . see and have the vision to make sure that something like this is offered,” said Connie Jaime-Lujan, Colorado State University’s Associate Director for Access and Success. She credited past and present leaders, as well as the school’s admissions office, to making sure Colorado State provides support as the program’s long-standing host institution. She added, “We had noticed in our district, right here in Fort Collins, that there were one or two students going every year, who could just walk in, whereas there were students paying for flights or buses from Texas to come. So we thought, how can we get our youth involved?” They instituted a program this year, including fundraising and peer encouragement, that brought the district’s participants up to a record 11 this year.